You are viewing a gorgeous English walnut Georgian pedestal table that measures ten feet when fully extended with a set of matching Queen Anne chairs also in walnut. I hope the photos do this classic set some justice, it’s certainly more impressive in the flesh. You are viewing a gorgeous English walnut Georgian George III pedestal table that measures ten feet when fully extended with a set of matching Queen Anne chairs also in walnut. I hope the photos do this classic set some justice, it’s certainly more impressive in the flesh. 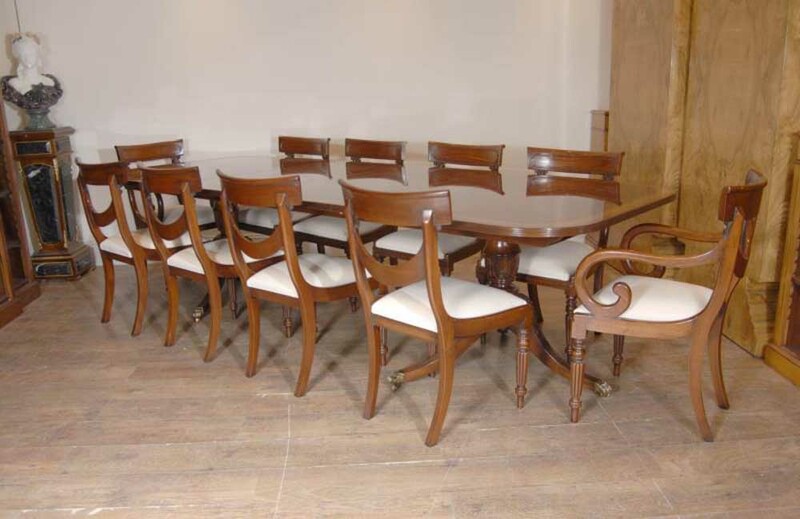 – Come and view this gorgeous dining set for yourself in our Hertfordshire showroom! You are viewing a 13 foot Regency style English pedestal table in flame mahogany with a matching set of Chippendale chairs. I hope the photos do this stunning set some justice, it’s certainly better in the flesh. The table sits firmly on the three pedestal bases which are on castors so you can move this around easily. When fully extended it is 13 foot long – and more than comfortably accomodates ten people – you can fit more if you wanted. This makes it great for hosting large scale dinner parties. The great thing is with these tables there flexibility. When you don’t need it so large you can unextend it by taking out the two extra leaves – you can even use it with just two pedestals, there is a variety of different size combinations. The finish to the flame mahogany is amazing – look at the grain of the wood in the photos – and the table is offered in very good condition with no scratches, solid and stable, ready for home use right away. The table is solid and sturdy with no wobbles and ready to home use right away. The finish is also in great condition. 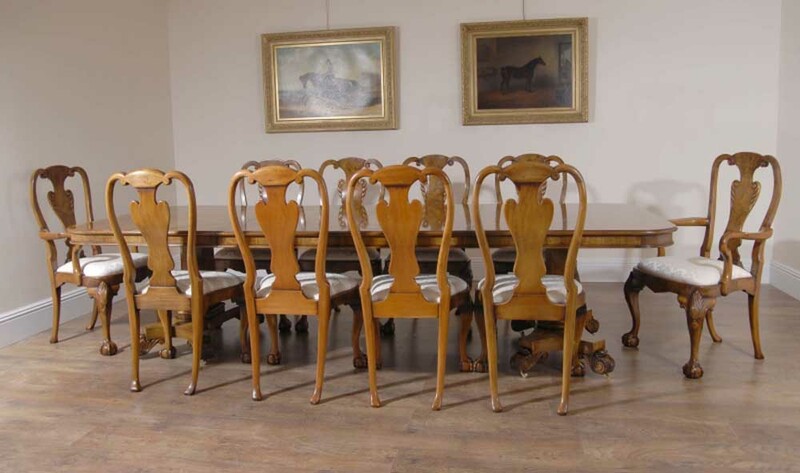 Around the table are the classic Chippendale style chairs with ball and claw feet and carved backsplats. Very comfy to sit in – 8 chairs, including two carvers (arms). It was hand crafted here in England to the highest standards and you won’t find a better dining set anywhere. We will ship to anywhere in the world. 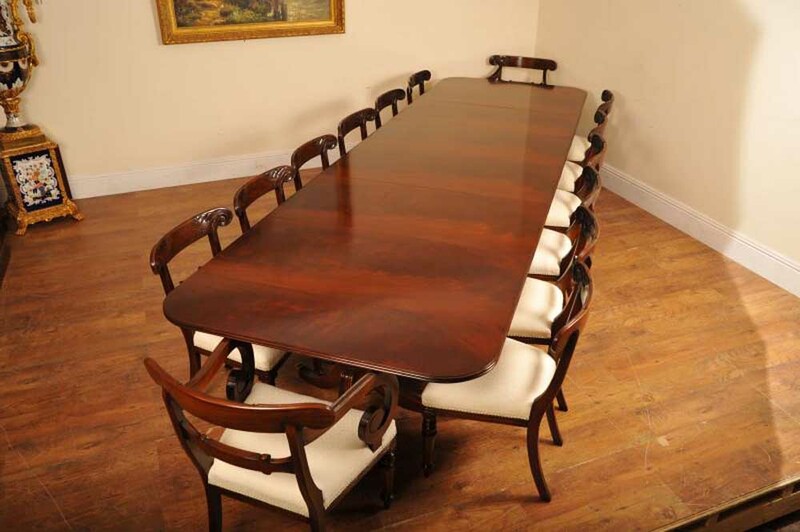 You are viewing an absolutely incredible English Georgian style dining table in burr walnut that measures 16 feet long. That’s right – 16 feet. Perfect for castles, chateaus, palaces, McMansions and executive boardrooms. Fully extended this sits 16 people more than comfortably and you can see from the photos we have a gorgeous set of matching Queen Anne dining tables in walnut around the table. This set of 16 is available so please email us if you are looking for the ultimate dining set – the ultimate accessory for large upscale dinner parties. Eating together whether with family or friends has to be one of the most important things we can do. So why not do it in absolute style with this table? 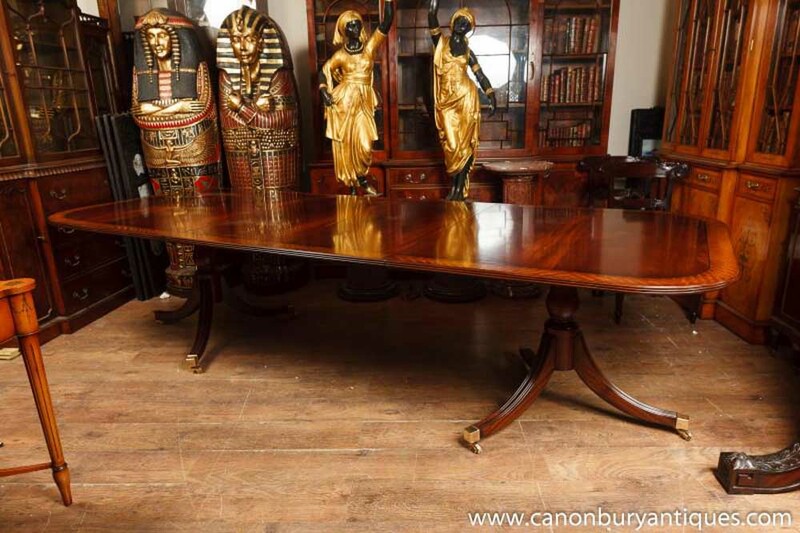 We appreciate it is quite a big initial financial outlay but this table will only increase in value, making it a great heirloom and hence investment – perfect for these uncertain economic times. We’ve come across quite a few tables in time but I can honestly say none come close to this work of art which wouldn’t be out of place in a Royal residence. The burr walnut is gorgeous – just look at the veneers used, the delightful grain of the wood – even to the sides of the table. The triple pedestal bases are hand carved in the George Bullock manner and on castors so you can move it around. The table has two leaves so there are endless combinations of sizes you can use with this table. You can use just the three pedestal bases without the leaves – and it would measure 12 feet long. Or you could use just the two D end pedestals to make it 8 feet long. It’s perfect as it can accomodate different sized functions to suit the occasion. The table was hand crafted here in England to centuries old traditions and will last for many more centuries hence making it a great investment and family heirloom. We bought this from a dealer in Debenham Suffolk. It is offered in great shape ready for home use right away. We also have the set of 16 chairs available so let us know if you are interested. This table is unique and will not be hanging around for long so get your bids in early. 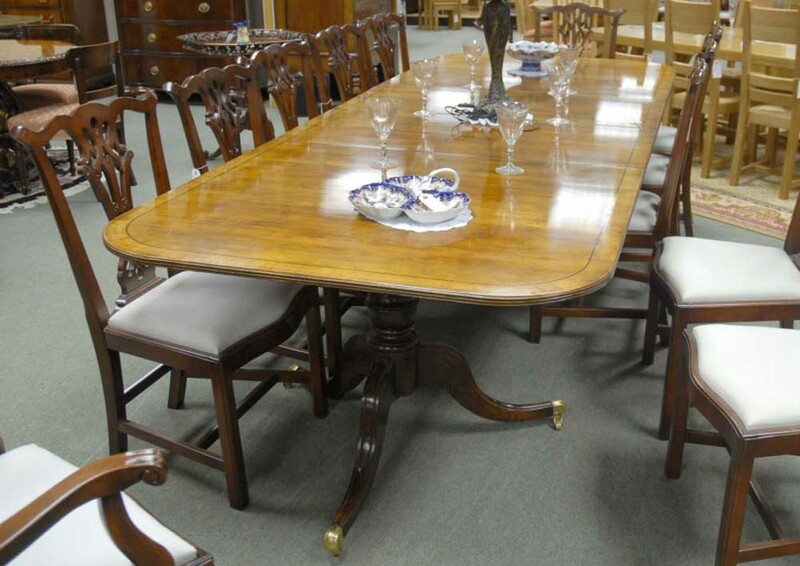 You are viewing a gorgeous English Regency style pedestal table in walnut. I hope the photos do this stunning piece some justice, it’s certainly more impressive in the flesh and would make for a great addition to any home interiors scheme. The table is offered in great shape, ready for home use right away, wobble free and ready to serve you for generations of service. We will ship to anywhere in the world. We have various chairs to match so please email if you are interested, we have pictured this with a set of Chippendales which look great. 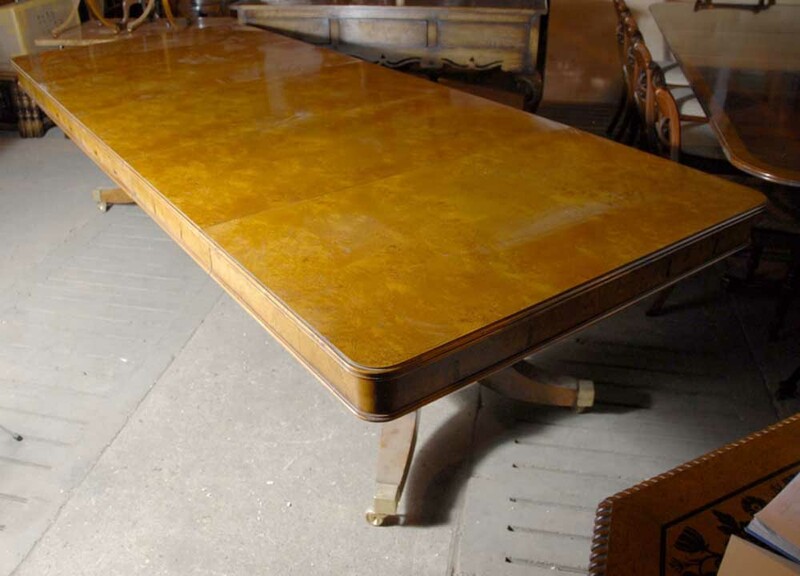 You are viewing a wonderful English Georgian style dining table with a split base. The table is an extender with three leaves each measuring 22 inches. When the table is fully extended it measures ten feet – perfect for large scale dinner parties as this table can sit 10-12 people more than comfortably. The table has been crafted from light walnut which has a lovely finish with all the beautiful whorls and grains of the wood. The table is on pedestal legs which in turn are on castors so this very easy to move around. The table is solid and sturdy with no wobbles. It would make the ultimate dining table and is also offered scratch free with a great finish to the wood. We bought this from a private house call in South Kensington, London and we will ship to anywhere in the world. This would make a great investment – both personally and financially. 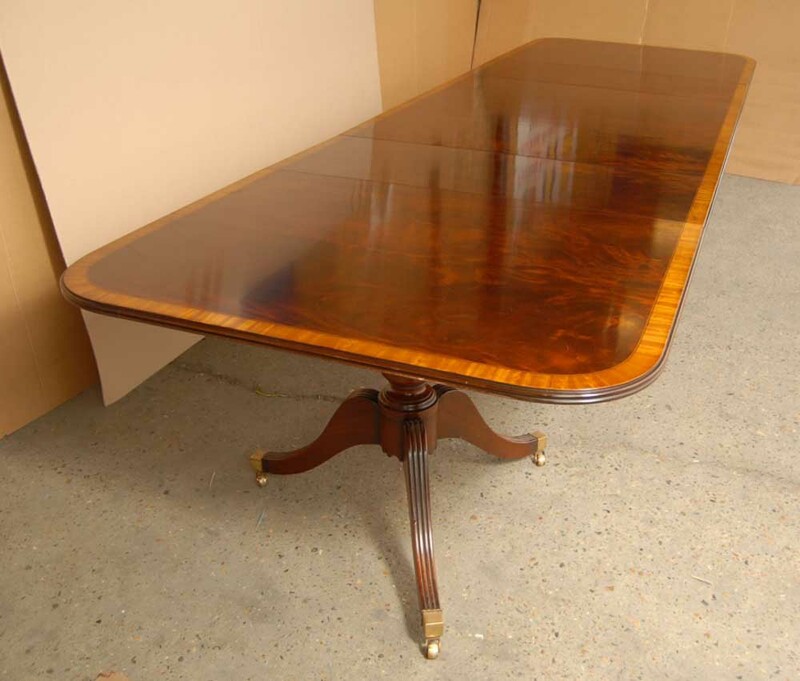 You are viewing a gorgeous 16 foot triple pedestal Regency style dining table. I hope the photos do this stunning piece some justice, it really is out of this world. The table seats ten people more than comfortably so this would make for a great piece for large, upscale dinner parties. You can fit more people if you need. The table extends to various different sizes. You can just use two pedestals if you needed for every day use or smaller gatherings. Thats the great thing about this, it’s flexibility. It’s easy to slot in the different leaves – there are two leaves in total each measuring 18 inches. 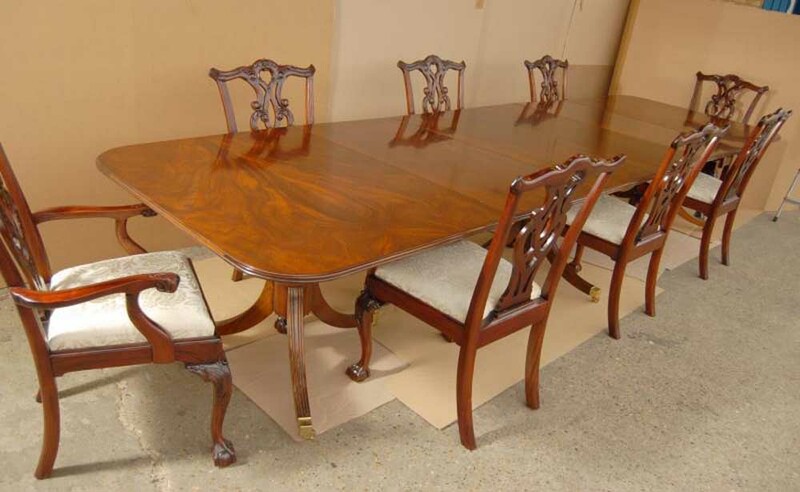 The table is in flame mahogany with a satinwood crossbanding to the perimeter of the table giving it that regal look. We bought this from a dealer in Sheringham, Norfolk and it is offered in great condition ready for home use right away. It’s a table fit for a king and queen and we wish you luck with your bidding.